Map showing the raw cotton trade between the American South and Great Britain in the eighteenth and early nineteenth centuries, courtesy of Revealing Histories: Remembering Slavery. 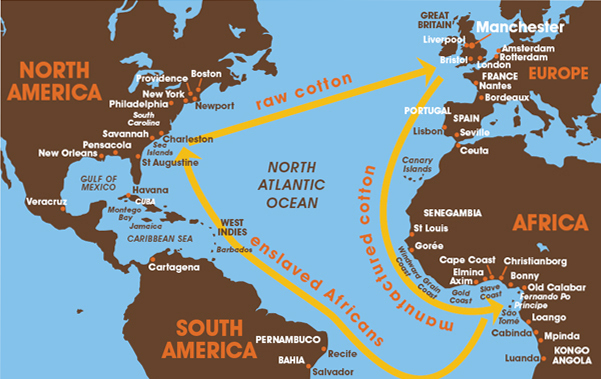 Even after the end of British involvement in the trans-Atlantic slave trade in 1807, and eventually the abolition of slavery throughout the British Empire starting in 1833, cotton manufacturers in Great Britain continued to rely on imports of raw cotton cultivated by enslaved labor in the U.S. South. 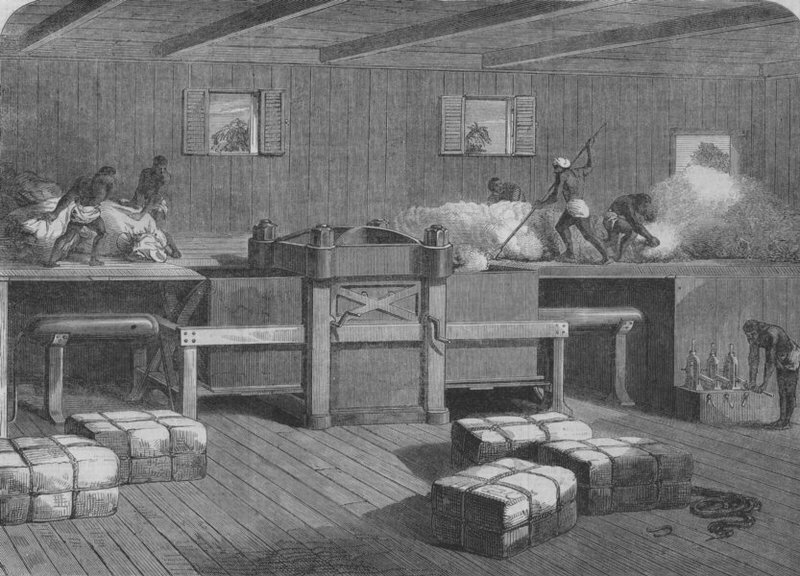 "Press for packing indian cotton," image from the Illustrated London News, 1864, courtesy of Columbia University. Before the Civil War began, the U.S. South supplied most of Britain's raw cotton, largely imported through Liverpool. The war greatly reduced the raw cotton trade from the South, increasing British merchant’s reliance on cotton imports from Egypt and India. The U.S. Civil War offered both challenges and opportunities for British businesses. On the one hand, the conflict drastically diminished the British cotton trade. On the other, the war brought economic opportunity for the shipping and armaments trades to provide military supplies, particularly to the Confederacy. In an international port city, Liverpool merchants were well positioned to find avenues for navigating and even profiting from the market fluctuations brought on by the war. For much of Great Britain, however, the Civil War meant disaster for the cotton trade. The manufacture of cotton cloth and thread was by far the country's largest industry in the mid-nineteenth century. It employed more than 600,000 people in England directly. Indirectly (through family units or other trades), nearly four million people, or one sixth of the English population, were dependent upon cotton for their livelihoods. When the Civil War began, the United States supplied about eighty percent of Britain’s raw cotton, and almost all of it arrived through the port of Liverpool. As a result of the Union’s blockade and the Confederacy's embargo, this figure fell to almost zero in August 1861, and American cotton did not exceed three percent of British imports while the war lasted. Although British merchants could obtain cotton from other regions, such as India and Egypt, Britain still received less than fifty percent of the raw material it needed during the war. As a result, mills closed, workers lost their jobs, and England's cotton manufacturing districts in the counties of Lancashire and Cheshire experienced widespread poverty. Merseyside Maritime Museum, photograph by Tony Corsini, Liverpool, England, October 16, 2007. Liverpool's Albert Docks on the Mersey River were a major point of entry for cargo ships in the eighteenth and nineteenth centuries, including ships involved in the trans-Atlantic slave trade before it was abolished in Great Britain in 1807. By the 1860s, cotton from the U.S. South supplying British textile mills was one of the dominant imports. 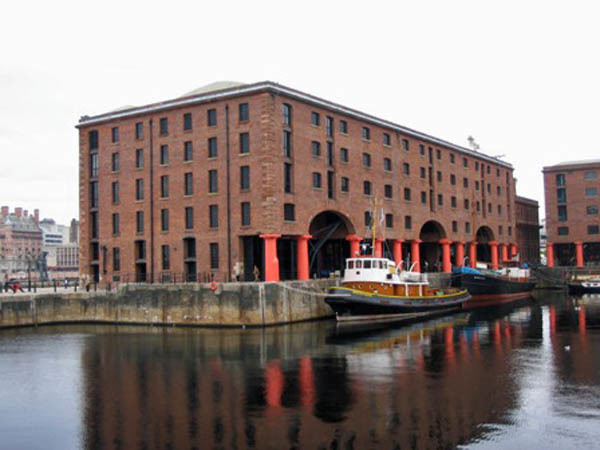 Today, the Merseyside Maritime Museum houses the International Slavery Museum, which addresses Great Britain's connections to slavery and its race and class legacies throughout the former British Empire. In contrast to the manufacturing districts, Liverpool had few cotton mills, and produced few textiles. Instead, this Atlantic port's main industry was trade, particularly of cotton. At the beginning of the Civil War, the cotton scarcity left the city's commodity shippers and cotton brokers vulnerable, but they soon found alternative opportunities. Despite cotton shortages in England, merchants would sometimes re-export the materials that did arrive to other ports in Europe. Notably, they also re-exported materials from the South to the North, because the Union also struggled from being cut off from direct trade with the Confederacy. As a result, during the war, cotton grown in the Confederacy could be shipped out of a southern port to Britain to evade the Union blockade, sold in Liverpool, and then shipped back across the Atlantic to a northern port, evading the Confederate cruisers. Liverpool's docks also benefitted as profitable wartime enterprises emerged, particularly the increased trade of commodities such as ships and armaments. The Union's merchant marine, nearly the world's largest in 1860, was devastated throughout the war in part by the Confederate warships supplied through Liverpool. In addition, as a result of the war, cotton speculation and brokerage, rather than trade in cotton itself, became immensely profitable for a number of merchants.